While the Systems' investment performance was historically constrained by state constitution and state statue, the Commission has approved a number of changes to the portfolio's target asset allocation. 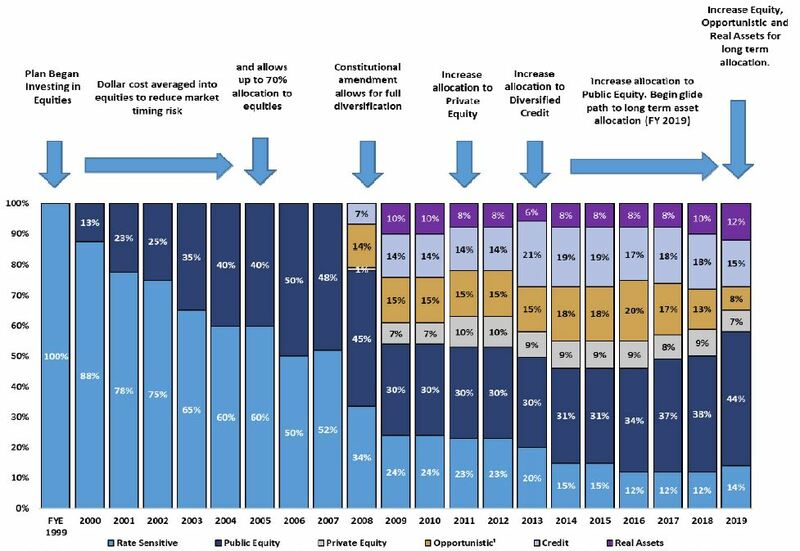 *Summarizes the asset allocation of the Retirement Systems' trust funds from inception through the most recent fiscal year periods. 1Portable Alpha Hedge Funds are expressed as gross exposure but, as collateral supporting the Overlay program, net to zero when calculating total Plan market value. For benchmarking purposes, there is a 10% weight assigned to it in the Policy benchmark. The Policy Asset Portfolio reflects the Commission's current day decisions on the optimal mix of assets to best achieve the long-term stated return objectives. Our RSIC staff also adds value to the portfolio by actively managing the mix of assets against the curent economic environment, business cycle, and market conditions. With the help of retained investment consultants, a central part of the RSIC’s investment approach is predicated on prudently managing costs and fees and ensuring we have a risk-focused and diversified investment portfolio.